Summer means sangria around here. It is cheaper than serving straight wine at parties and I like it so much better. 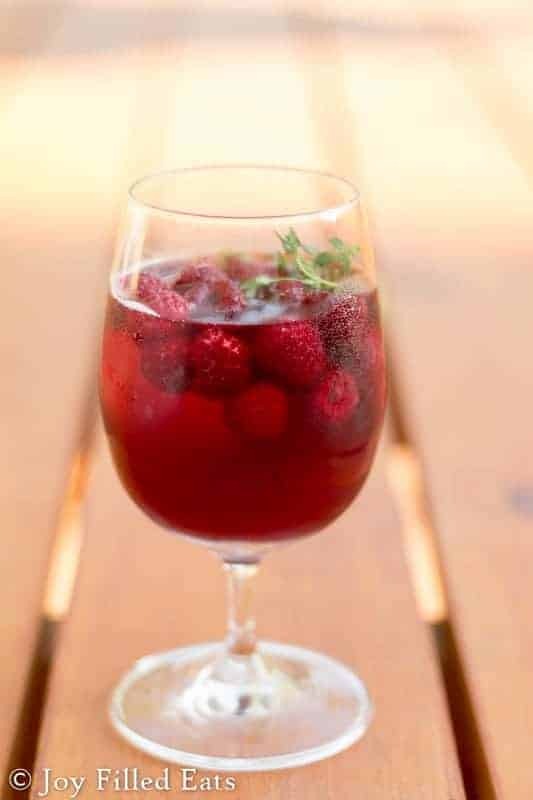 This Easy Sangria Recipe is so flavorful and has only 5 net carbs per glass. My secret ingredient is using a raspberry tea bag and a sprig of fresh rosemary or thyme. 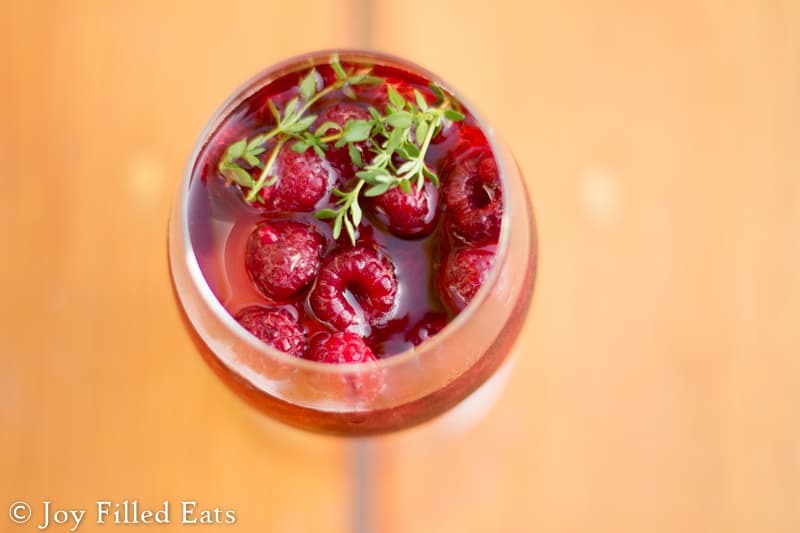 The herbs really enhance the flavors of the wine and the berries. This is a sweet sangria and goes well with almost anything. My standard sangria recipe is 1 part pinot grigio to one part apple juice. It is very delicious but not low carb. I wanted to make a version that would be friendlier to my diet. Raspberries are one of my favorite berries and since they are naturally low in sugar they are great for low carb recipes. The only carbs in this are from the wine and raspberries. Using raspberry tea as part of the base means this has fewer carbs and sugar than straight wine. 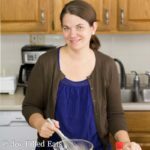 If you are interested in making this with a low carb wine here is a great article from All Natural Ideas. 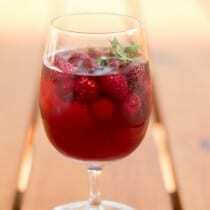 To make a whole pitcher of sangria simply use a 750 ml bottle of red wine and multiply the other ingredients by 6. Pour boiling water over the tea bag and the thyme or rosemary in a glass measuring cup. Steep for 5 minutes. Remove the tea bag and herb. Add the sweetener and stir to dissolve. Add the ice water. Add the rest of the ingredients. Enjoy! Not really since you can't use juice. I'm not sure if a non-alcoholic wine would be on plan. Otherwise, it would just be a sweetened iced tea. Still yummy though! Do you have a certain type of red wine? I love sangria but have only had it once or twice and never made it myself. Would love to try your recipe but when it comes to picking out wine I am a novice! lol Thanks!! I made this tonight and it was really tasty. I used club soda instead of water. Thanks!